After driving about 65 miles east on I-10 from Tucson out to Dragoon, the pups needed a stretch and we needed some good food. 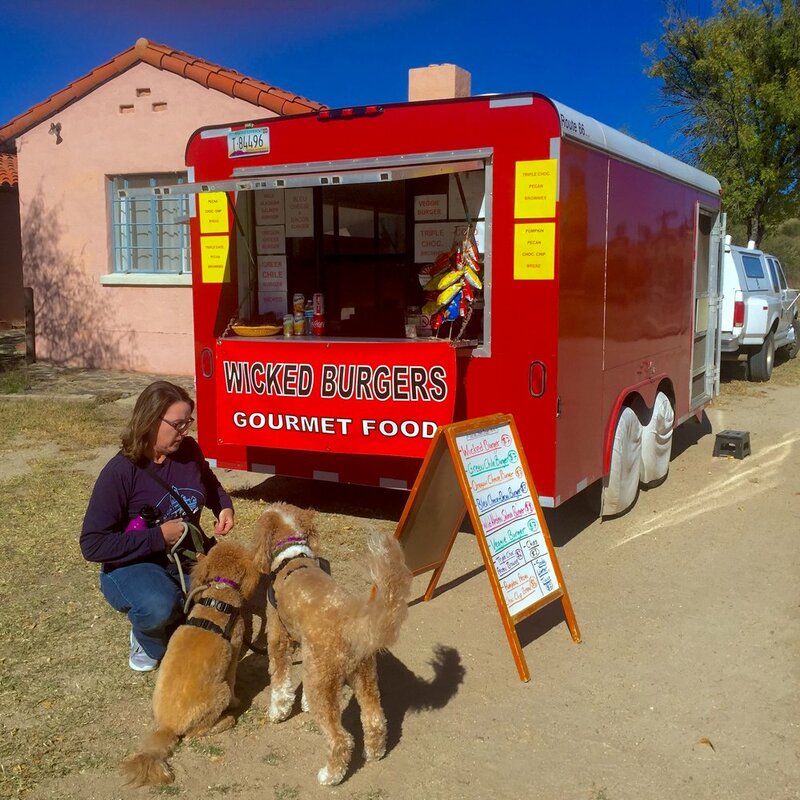 The Wicked Burgers Gourmet Food Truck was serving that weekend at the Amerind Museum, which is conveniently located right off the Dragoon Road exit from I-10. We walked around a bit, but the burger smells kept wafting our way. We had to order. Matthew got the Green Chile Burger while I could not resist the Oregon Cheeseburger. The 1/3 pound sirloin steak burger was cooked to a perfect medium and absolutely delicious. After Matthew took the photos of the burgers, he asked if I wanted any condiments. Looking at the melted Tillamook Cheddar and the grilled onions, I declined. Who would desecrate a perfect blend of flavors with ketchup? Bernie and Lizzie agreed with me, when we shared a few burger nibbles with them. After lunch, we kept exploring the museum property. We walked around to the picnic area where we found the beautiful granite rock formations the Dragoon Mountains are known for. Bernie and Lizzie hopped on a few of the rocks that were easily accessible. If you visit, be careful in this area. Rattlesnakes could be anywhere and these rocks are definitely their home. Even though both of our dogs have had Rattlesnake Avoidance Training, I cautiously checked around rocks before I would let the pups scramble around. There were picnic tables and a restroom. If you’re hiking in the area and you’re looking for a good bathroom, this one will certainly serve your needs. A flush toilet, sink, and ample supply of soap and paper towels all housed in a large enough single room restroom that I could safely bring the pups in with me. Once Bernie and Lizzie burned off some energy and we burned off a few calories, we headed back to the car and drove the last 21 miles to the Coronado National Forest to visit Cochise Stronghold. Read more about our adventure learning more about Arizona history here.